Floating on the lake or sitting at the end of your favorite dock fishermen all seem to enjoy the long days of summer. Part of a true fisherman’s regime is to pack their favorite tackle, hooks, bait, and fishing rod! But that’s not all we need to pack! Today, with all the warnings about increased likelihood of skin cancer through prolonged, unprotected sun exposure, many fishermen still ignore the basic prevention steps. Whether it’s from misinformed it-won’t-happen-to-me, or a lack of being properly informed, the message still needs to get across. The research is done and overexposure to ultraviolet sun rays will have a damaging effect on our skin. All we need is to take extra precaution when spending time in the sun that includes sunscreen and a portable UV sun shade umbrella. The best plan for staying safe in the sun is to cover up as much as you can. Don’t wear just anything; most materials don’t block the harmful UV rays that can cause skin damage and even cancer. Make sure the material you are covering up with is at least UPF-30. Take along your JoeShade, portable umbrella with tripod stand, that’s easy to set up and has fabric that blocks out 99% of harmful UVA and UVB sun rays. In addition, a hat is a great way to protect your face and neck. There are two types of hats that can protect you well. The first type is a wide-brimmed hat that will protect you while also providing shade. The other type is a baseball style cap with flaps that cover the sides and back of your neck and ears. So why roll the bait? Bring your sunscreen, and plenty of shade options. 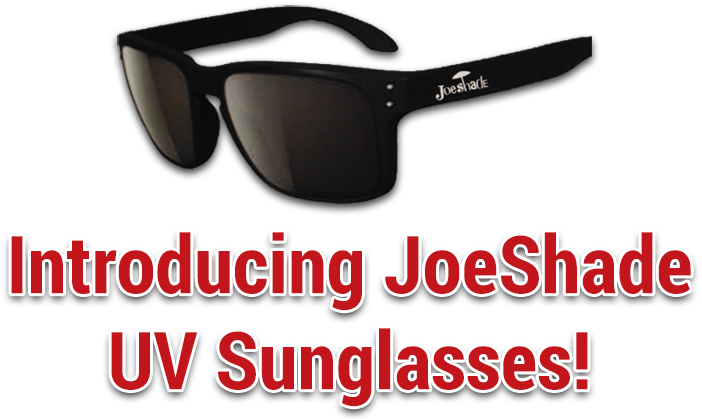 For a long day in the sun there is nothing better than bringing along your JoeShade, portable sun shade umbrella. Order your JoeShade umbrella today and the only thing frying will be the fish!